The farewell to 2015 will not be fair without a brief reflection of the improvement Samabe has achieved in the year. Samabe family has been growing bigger in its second year and it received much more support. Therefore, by the end of 2015, the all inclusive resort in Bali has acquired 5 acknowledgements, which is a big step for a beginner. As the fan of batik, a national heritage of Indonesia, Mr. Arief Gunawan as the initiator of the award granted resorts and restaurants that preserve batik. Using Batik stamps as a part of its interior decoration, Samabe Bali Suites & Villas has been selected as the best batik beach resort. Recommended by a luxury travel guide is one of the honor Samabe Bali Suites & Villas has received in 2015. 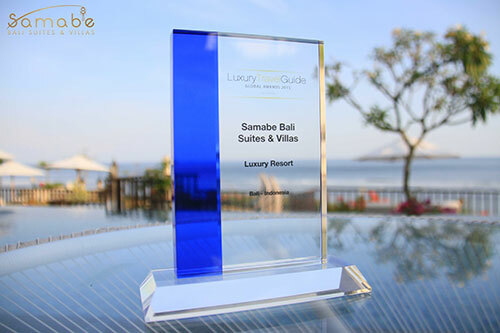 Samabe Bali Suites & Villas is now more well-recognized nationally after receiving the prestigious award as best luxury villa from Indonesia Travel Tourism Award. It is selected among thousand hotels and resorts in Indonesia. The concept of Unlimited Privilege that allows the guests to experience the whole luxury of the resort has brought Samabe Bali Suites & Villas to the Best All Inclusive Luxury Resort by Hotel of The Year.